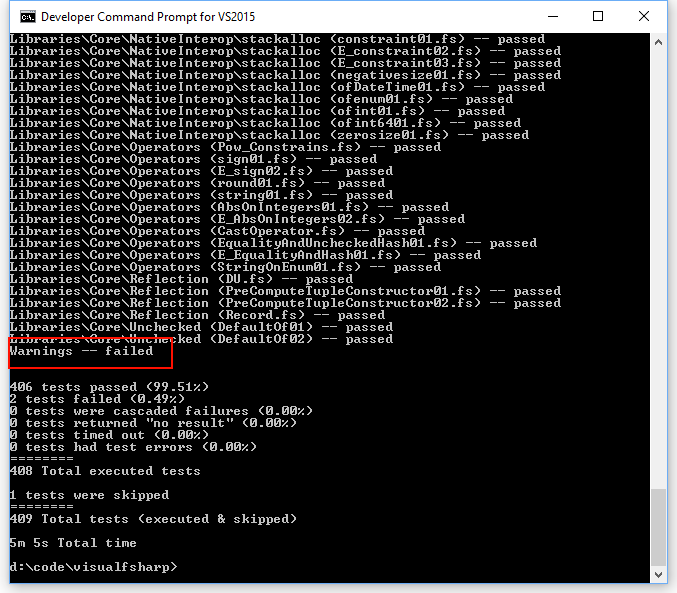 2016 » Rash thoughts about .NET, C#, F# and Dynamics NAV. A couple of months ago I wrote a blog post called “Make failure great again” and this joke backfired on me. 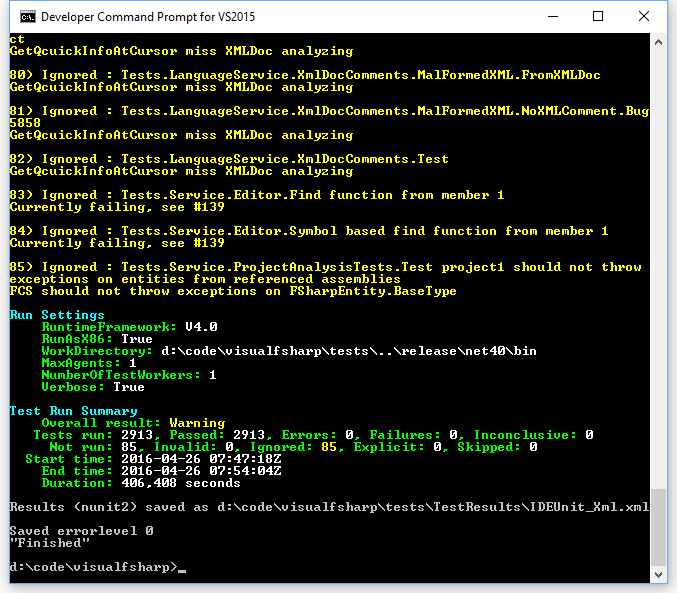 The post was meant as an introduction to the F# compiler project and showed in a simple scenario all the steps that are needed to get a Pull Request into the compiler. Before the change the compiler would just complain about the type error between the if and the corresponding else branch. Newcomers from statement-based languages like C# might have a hard time to understand what’s going on. 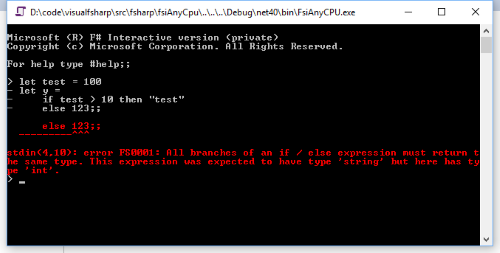 This message now additionally explains that F# treats “if/then/else”-constructs as expressions and the return type of both branches must return the same. Obviously this is not correct, but what exactly went wrong? In order to understand the problem we need to take a look at the principal change of the pull request. This strange looking code is part of TypeChecker.fs and represents the part where F#’s compiler tries to type check “if/then/else”-constructs. It uses pattern mattching on the abstract syntax tree (line 1) to destructure the current expression and calls the the type checker with all sub-expressions recursively (look for TcExpr* calls). In line 15 I added context information to the current type checker environment. This allows the type checker reporting engine to show a more concrete error message if a type check fails. The new bug is that we actually type check recursively and that the context information is passed down into all sub-expressions. So basically every type error somewhere in a else branch will show this way too specific error message. Ouch. This code splits the type check in two parts. In line 1-2 we type check the else-branch with a fresh type variable and in line 4-5 we add the missing restriction that our if and else branches must have the same type. This actually works nicely and limits the error message to exactly the one type check that we want. Fortunately red unit tests on the CI server catched the factÂ that I introduced a new problem.Â It took me a while to understand the problem, but it comes down to the fact the the type checker also acts as type inference algorithm. 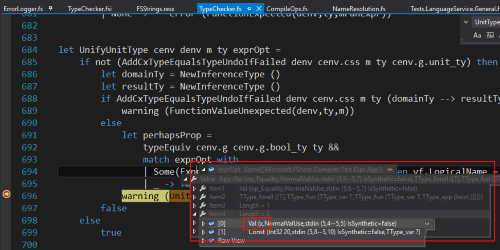 In contrast to C#’s var keyword where types are only inferred from the right side of an assignment the F# compiler also infers types from the context.Â By splitting the type check into 2 parts we didn’t pass captured type inference information (in overallTy) down into the recursive type check call and therefore some specific situations can’t be inferred anymore. Ouch. 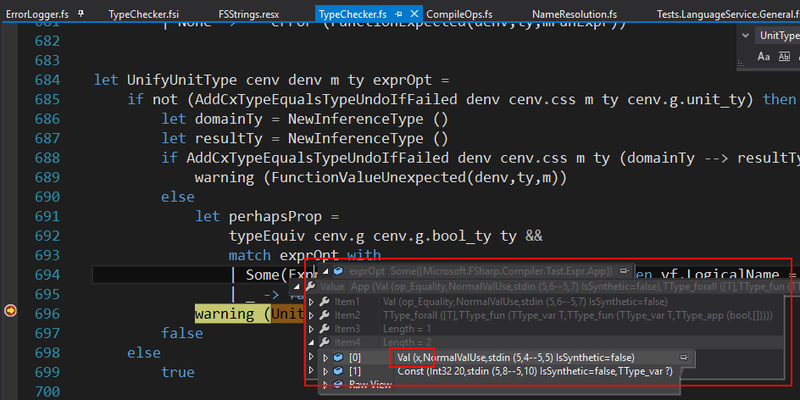 I also forgot to pass the new type checker environment to the UnifyTypes call. This would probably have fixed all tests in the compiler code base, but since we would still change the order of type checking there might be cases that are still broken. So that’s a risk we clearly don’t want to take just for fancy error messages. So what’s the correct solution then? We still need to limit the context to the last type check but we can’t split the check in this naive way. One way to do that is to keep track from where the context information is coming. The F# compiler is already using a “range” type to specify locations in the source code. If you are interested in the details then take a look at #1827. 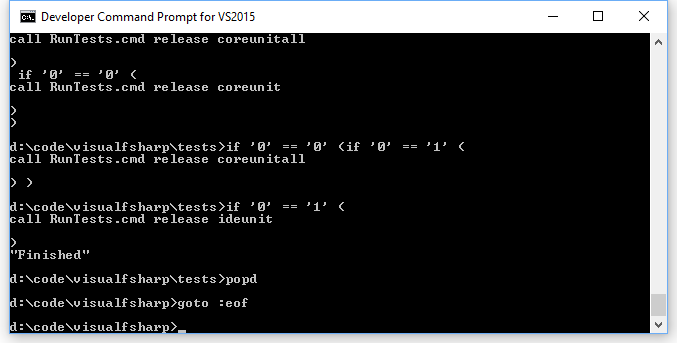 A couple of years ago I was flying to Canada and was bored enought toÂ write a Sudoku solver console app in F#. For some reason I was thinking about that today and thought that I should try to put that into a F# React Native app (see this blog post for an introduction). You can find the full source code atÂ https://github.com/forki/SudokuApp. You can find the full source code atÂ https://github.com/forki/react-sudoku. You can find the full source code atÂ https://github.com/fable-compiler/fable-virtualdom/tree/master/samples/sudoku. You can find the full source code atÂ https://github.com/forki/sudoku-electron. and with Electron as Desktop app on all operating systems. I my last two articles I introduced React Native app development with F# andÂ showed how we can doÂ HTTP calls with the Fetch API. I also mentioned briefly how to access the local storage of your phoneÂ in order to cache information. In this article I want to look a small bit deeper into this. This is still a very low level data storage API, but as the sample app shows it’s already useful for caching specific app data. I my last article I introduced React Native app development with F#Â and mentioned briefly that we can do HTTP calls with the help of the very popular Fetch API. Retrieving data from the web with Fetch is really easy. In the following snippet we just pull a bit of JSON from a HTTP resource and cast it to a custom type. If you need to do more complicated calls then take a look into the Fetch docs. Many of the properties and functions are already available in the Fable bindings. If not please create an issue atÂ the Fable issue tracker and I will try to add it. Giving good error messages is very important for modern compilers. The language Elm is famous for giving excellent user-friendly error messages. 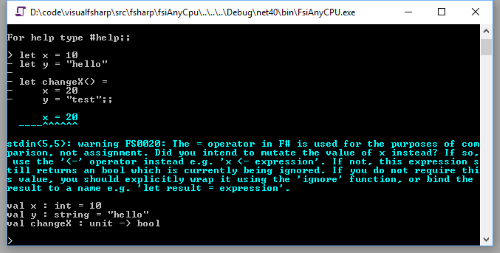 Parts of the F# community decided to improve the F# compiler messagesÂ as well. We want to make that a community effort and hope many people join us and help to make the compiler emit better error messages.Â Â Isaac AbrahamÂ is mainatining a list with possible targets, so if you are interested in helping then take a look at this list. Unfortunately working on compilers it’s not exactly the easiest task. In this post I want to show you how I tried to improve one compiler warning and hope this helps others to get started. As you can see the new message is giving the user more details about the specific situation and also refers to a common error of newcomers. Please notice that this is probably not the final wording for this warning, but once we have finished thisÂ it will be easy to iterate on the concrete warning. This last step will download the internet for you, so don’t be too surprised when you find the lastest “Game of Thrones” episode somewhere inside your packages folder. If the build doesn’t work for you then read the DEVGUIDE very very carefully. If that doesn’t help then please open an issue in the Visual F# issue tracker. Using the F# Interactive in debug mode is an easy way to do compiler debugging. 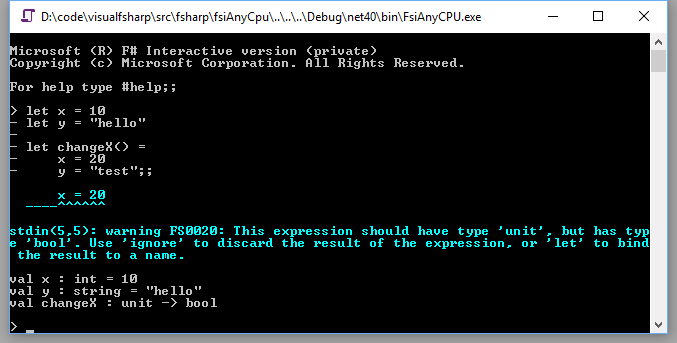 There are other possibilities (like using fsc.exe), but the F# Interactive allows you to debug the compilation of single lines in isolation from the code above. It’s really neat. Since we now know how to reproduce the compiler warning, we want to make actual code changes. But where!? An easy way to get started is by usingÂ the old error message as a search string. 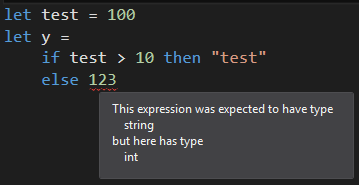 When we use Visual Studio’s solution-wide search and look for “This expression should have type” we find exactly two locations inside a file called FSStrings.resx file. So this gives us a new search string “UnitTypeExpected1”. We can try to set another breakpoint and see what happens in that code. The interesting part is the inner else part. The code in there looks scary and cryptic at first, but it actuallyÂ shows the power of using a ML dialect for building compilers. Inside this code the compiler already knows that we want to emit a warning. By pattern matching on the abstract syntax tree (AST) we decide if the left side of the expression is a property. In that case the compiler seem to emit a different warning (see also that code above from CompileOps.fs). So somewhere inside that AST we can actually find our name x. Now we have all we need. It’s good practice to never make code changes on the master branch. So let’s create a feature branch with “git checkout -b assignment-warning”. This doesn’t look super nice, but it follows one of the important rules from the contributor guide – “use similar style to nearby existing code”. We probably want to tidy this up later when initial code review is done. But in the beginning we should stay as close to the original as possible. Wow. We did it. We actually changed the compiler. And it didn’t even hurt that much. Compiler tests (especially if you want to tests negative results like warnings or exceptions) can’t be easily done in standard unit tests. The F# team came up with a different approach where the test runner compiles a .fs file and you can use regular expressions to match against the compiler output. 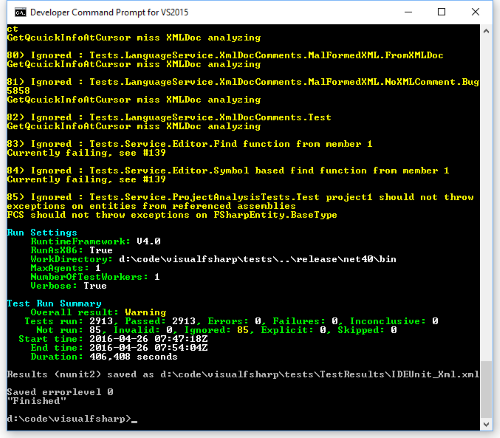 In order to run the existing test suite call “build.cmd all”. So good news is we didn’t break anything, but the bad news is that we don’t have tests covering our case. So let’s add one. After we ran “build.cmd all” again it’s now time for the final phase. Commit the changes locally and use “git push origin assignment-warning” to publish your code. Now go to the Visual F# GitHub repo and create a pull request with an explanation of what you did and what you intended to fix. Often it’s also useful to include one or two screenshots. Your PR will then go through code review process. Usually you will get a lot of questions and probably you need to change some things in your proposal. This process can take a while soÂ bring a bit of patience. 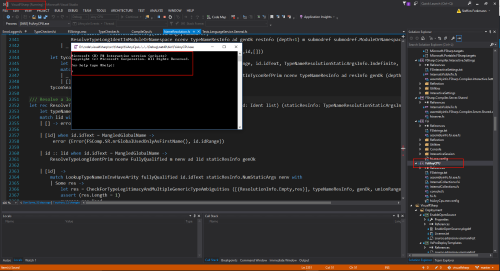 In .NET/mono land things are slightly better. 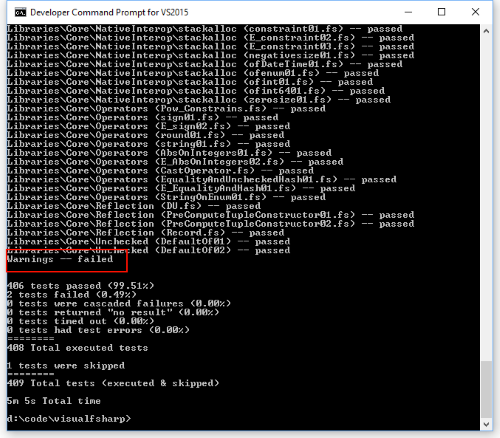 Users can’t delete packages from nuget.org, they are only allowed to “unlist”. Unlisted packages won’t be suggestedÂ for new installations, but are still available on the server so that builds won’t break. In most cases thisÂ is a good thing for users, but even on nuget.org packages can be removed permanentlyÂ and this already affected some projects. For Paket v3 (currently in alpha) we implemented a solution for this problem. With this version we can configure additional cachesÂ which will automatically be used to store all external dependencies in a safe and controlled location. Et voilÃ : all builds on all TeamCity agents and developer machines became green again. A couple of days ago I tried to fix a bug in the .NET/mono dependency manager “Paket“. The bug was a really strange edge case in Paket’s resolver algorithm that resulted in a false positive conflict (an overview about the algorithm can be found here). In other words: Paket reported a version conflict where it should have reported a valid package resolution. After some investigation I found that the bug was in some optimization code that tries to cut parts of the search tree. When I disabled that part, the resolver found a valid resolution, but was significantly slower. So after some further testing I came up with a fix that was fast and solved the issue. But why didnâ€™t we find that edge case before? And most importantly: do we have other bugs in the resolver? Isaac Abraham suggested to investigate the resolver optimizations further and proposed to use property based testing for this (see Scott Wlaschin’s blog for amazing introduction material). In this post I want to evaluate if Paket’s package resolver works correct. Let’s start by clarifying some terms. A “package” consists of a name, a version and a (possibly empty) list of dependencies. In this post we are only talking about meta data. The package contents are irrelevant. A “dependency” is always referencing another package name and defines a version requirement (e.g. >= 2.0 or < 4.1). The “package graph” is a list of packages and acts as a stub for a possible configuration of a package feed like nuget.org. It’s basically a collection of the meta data of all published packages. A “resolver puzzle” consists of a package graph and a list of dependencies. In other words it defines a possible configuration of the package feed and a specific list of package requirements (basically what you would define in paket.dependencies). A “resolution” is a list of packages that “solves” the resolver puzzle. This means all package requirements are satisfiedÂ andÂ we don’t have more than one package for a every package name. Our goal is to show that Paket’s resolver is returning a version conflict if and only if we can not find a package resolution via a brute-force algorithm. We do not compare resolutions, we just want to know if the optimization is missing some valid resolutions. Usually FsCheck will just generate random, uniformly distributedÂ data for whatever data type it sees. This is a very good default, but in our case this would result in 99% package graphs that have no resolution. In order to create more sensible data and increasing the likelihood of finding real bugs we need to write our own generator functions. Here we just map a triplet of non-negative integers to a version of form major.minor.patch. The last step is to create some package requirements to that graph that we want to resolve. This is basically what you would write into your paket.dependencies file. And this point I reverted the fix in the optimization code and started the test to see what happens. FsCheck needed about 3s to come up with a random example where a valid resolution exists but Paket’s resolver didn’t find it. That was an amazing moment. Unfortunately the example was HUGE and very complicated to understand. Most property based testing frameworks have a second important feature called “shrinkers”. While generators create random test data, shrinkers are used to simplify counter-examples and have type ‘a -> seq<‘a>. Given a value (our counter-example), it produces a sequence of new examples that are “smaller” than the given value. These new values are tested if they still falsify the given property. If they do a new shrinking process will be started that tries to reduce the new example even further. The ouput shows that FsCheck generated a random puzzle with 104 packages and reduced it to a sample with only 3 packages and 2 package requirements. This made it pretty easy to analyze what was going on in the optimization part of the resolver. The sample was even smaller than the one that was reported from the wild. So now FsCheck discovered a new, previously unknown bug in Paket’s resolver. The sample shows 2 packages and one of the packages is requiring a non-existing package. This is trivial case and the brute-force algorihm is instantly finding a solution. So what is wrong in Paket’s resolver? Again the answer is hidden in some performance optimization and the fix can be found here. But this was not the end – the property based test spotted yet another counter-example so I fixed that as well. It took me a while to build up property based testing for this complex scenario. Most of the time was needed to build custom generators and shrinkers, but I was able to reproduce a bug from the wild and also found two new bugs. I think this is a big success.